An electric current won't flow through a circuitA collection of wires and electric components connected together in such a way that electric current can flow through them. unless there's a source of energy like a batteryA battery is two or more electric cells joined together that can produce an electric current when connected to an electric circuit. or mains electricity to push the electric charges along through the wire. 'Voltage'A measure of the energy of the electric charges in a circuit. is a measure of how much energy the electric charges have between two points in a circuit. The voltmeter measures the energy across the bulb in volts V. In this case, the voltage is 1.5V. Voltmeters are always connected in parallel with the component you want to investigate. 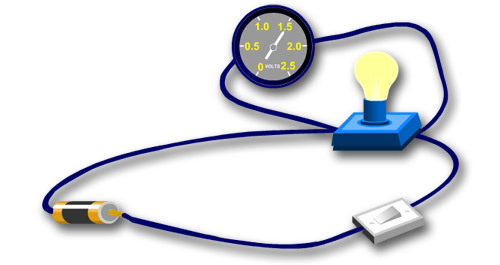 Open Circuit Builder and use a voltmeter to measure the voltage across components in a circuit. Use Circuit Builder to see what happens to the voltages in your circuit if you use a 3V battery or a 1.5V cell. If we increase the voltage by adding extra cells or batteries we give the electrical charges more energy and so, the current flowing around the circuit increases.